I stopped “Big Magic” to return to “Eat, Pray, Love” for some life advice. I assume many of you know, she keeps an active Facebook, Instagram and Twitter accounts, so I follow her regularly on all three. I love reading her words of wisdom daily or almost daily and trying to figure out how to infuse what she tells us into my own life. She is so wise. I read “Eat, Pray, Love” for the first time around the time when it came out, in 2006.. I read it because it was the book to read at the moment. But I never soaked in what she was trying to say in her book. This time around, I read it again because I needed to. I needed my dosage of Liz on a grander scale than just her daily posts on Facebook. I needed her mentoring about life. I wanted to know how she went through some tough times and got through, what was her method? Anyway, she recently announced that she was getting separated from the man she met in the last chapter of “Eat, Pray, Love.” It was shock to all of her followers I am sure. But it made me applaud her, she always ran to the beat of her own drum, a wanderer of sorts through life. She was inspiring. I then began to look back at other writers I loved in my life… with the exception of Laura Ingalls Wilder, most of my favorite writers weren’t married. Jane Austen, not married. Louisa May Alcott, to my research… never married. Liz was married once, and now this would be her second marriage. These famous writers have something in common – independence. They are strong enough in their own minds and hearts to carry on their own away from the confines of marriage. I applaud them. So many women these days, particularly women my age (33 and older) feel that it is a must or be viewed as some sort of failure in life. I am not married, even though I so want to be, but I also enjoy this life. I am a successful writer, living on my own doing my own thing… I have good friends and family. I have accomplished a lot in my life. I don’t pretend to know the reason behind Liz’s separation from her husband, it could be a myriad of things, but I still applaud her strength and ability to move forward with her life. I applaud all of the other authors before her too, that found the strength to remain independent in their own lives and in their craft. For me personally, this doesn’t only speak volumes in terms of my “creative work” but also in my personal life. I have struggled tremendously with this over the years, and as I have gotten older I realized that I can’t stop anyone’s opinions no more than anyone can stop mine. So why bother getting all bothered by it? When I read this entire passage, I said, “what did my friend have a chat with Liz about this?” Because she has been telling me those exact words forever. And I still don’t think I can wrap my head around it. Of course Liz had some other wonderful passages to share with her readers, but I will not give it away because you definitely need to take the time to immerse yourself in her book, especially if you are like me who is trying to live a creative life though writing and reading regularly. As I read the next 50 pages of “Big Magic” by Elizabeth Gilbert, so many thoughts came to my mind. This book, is very much like a tutorial on living a creative life and has been at times all over the place with thoughts and ideas that it was often hard to keep up. Today is a good day! 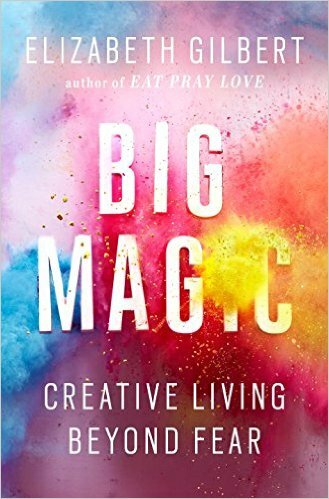 Author Elizabeth Gilbert’s new book “Big Magic: Creative Living Beyond Fear” has arrived and it is simply wonderful! Of course, I had to have it today, I couldn’t wait one more day for it, so after work I ran to Barnes & Noble and grabbed my copy. Let me let you in on a little secret, Amazon has one coming to me on Sept. 29, but I couldn’t wait that long and what is wrong with having two books? I didn’t want to wait to read it either, while I am in the middle of many other books at the moment, I simply had to start reading and devouring Liz’s book. And so far it is excellent. It is an easy read filled with anecdotal stories and inspiration. And I swear I can hear her as I am reading this book, I hear her humor and wit. For those of you that haven’t started reading it yet, (because you aren’t crazy like me who ran through a mall parking lot quickly grabbed the book and ran back to her car before the meter maid could ticket her), I won’t give too much away. Embrace your fears about creativity, understand that they will join you on your journey, but never under no circumstances let them direct your path. Be brave and have “stubborn gladness” in your pursuit for creative living. We all have “buried treasures” within us that are just waiting to be discovered if we want to. So far ( as most of her fans figured) Liz shines and she is a true hero to us all. I strongly encourage you to pick up “Big Magic” tomorrow and get started on reading it. Elizabeth Gilbert: A True 19th Century Writer! I finally finished “The Signature Of All Things” by Elizabeth Gilbert and words can’t describe how much I enjoyed this book! I have not read a book that carries the reader from birth (or pre-birth) to death like Liz does. What I loved about reading this book, is that it even though it is a big book (500 pages) it reads so easily and surprises you when you least expect it. When you’re reading Liz’s book, you can’t help but feel as if you are reading a 19th century writer, she got the voice of her characters perfectly and brings you into the story to a point where you find yourself thinking about it for hours after you’ve stopped reading. For those that don’t know anything about this book, it tells the story of Alma Whittaker, a 19th century botanist that comes into her own in the world of plants and evolution. I really connected to this character, and I have to admit at first I didn’t think this would be possible, given all the mention of science. But it reads so easily that you won’t be able to put it down. Liz definitely did her homework when it came to the research for this book, I can only imagine what went into learning all there was to learn about mosses and botany as a whole. I will say that throughout reading the book, there was such a sad undertone, so many of the characters, especially Alma had made so many sacrifices in their lives and lost so much. You will have to read it to understand more about what I am talking about here. This book is definitely worth a re-read and it is definitely a book that belongs alongside books like “Pride and Prejudice,” “Jane Erye” and “Wuthering Heights.” Liz is the master of the written word and deserves a major applause for this book! I can’t wait to see what she will be writing next!